Dogs are our passion and we have been fortunate enough to be able to include this passion in our lives. We specialize in stocky built working dogs that are bred to AKC Standards. We take pride in our dogs as being even-tempered and self-confident. 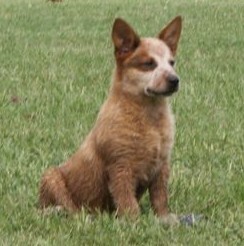 Australian Cattle Dogs are amazing intelligent dogs - their abilities go above and beyond. We feel it is important for each dog to have their own job may it be working, showing, or companions. Our dogs have been placed throughout the United States, Canada and South America. We breed for temperament, conformation, agility and herding. Quality is what counts. Whether a dog is in a show arena or cattle arena - they should work to the best of their & your abilities. Even though this breed is known to have "natural" instincts, they still require time and training. The outcome is the direct result of the time and effort you were able to give as well as the dog's abilities. Puppies are on a strict worming and vaccination schedule. They are socialized with our dogs and family. We believe that the more social a puppy is the better dog he/she will make. These dogs are good companions and tend to choose their owners. They need plenty of exercise and keeping them occupied will help keep them out of trouble. All puppies leave the ranch with a health guarantee and go only to approved homes. We have puppies all over the United States and welcome repeat customers and referrals. If we do not have any pups that will fit your needs we will refer you to someone else. The most important thing for us is that dog and person are an equal match! Here is a poem that a customer wrote about an ACD he purchased out of one of our litters! Rain or shine, She is always right behind. Whether I am up or down, She is always around. When I sit down to eat, She is right at my feet. Wherever I go, She is with me I know. Hike, walk or run, She will follow for fun. Can’t leave her alone, She is my own. With a nip at my heel, She keeps it real. Without resistance, She goes the distance. With unmatched loyalty, She treats me like royalty. The change was discreet, first seen on a sunny street. Two legs were now four, the pace picked up a bit more. Best friends are we, none better could there be. When I lay down to sleep, my security she will keep. And when I arise, She has only love in her eyes. All this I know will never end, until for her soul God should send. Jeff Jaquish was kind enough to grant our website permission to show his video of the amazing Australian Cattle Dogs in action! Jeff comments on the video, "Most of the dogs you see herding are in the top ten ACD herding dogs of North America who come from working ranches. One in particular is the Canadian ACD National Specialty top Herding Dog as well as the American ACD National Specialty Herding Dog. Most people who view this slide show do not realize they are seeing some of the best and the absolute proven best herding ACDs in North America. ALL herding shots were taken under these situations: ACD Club of America 2007 National Specialty, AKC sanctioned herding trials, ASCA sanctioned herding trials, ACD Club of Canada sanctioned herding trials, ASCA of Canada sanctioned herding trials, Herding clinics, Working on a real ranch, on real cattle in real situations".